We have the morning free and decide to have another crack at the Prince-Bishop’s Palace. Ah. The lift to the platform is out of order. Rose and Chris run me up the escalator. And lift me up the steps on to the train. And lift me off again at Liege-Palais. Ah. We have a problem. There is no lift down from the platform. We’ll have to take the escalator here, too. No, they’ve thought of that. The escalator doesn’t work either. In fact it’s wreathed in cobwebs. Perhaps grass. And if they did manage to carry me down the two LONG flights of steps there’s still another couple of LONG flights up from the station to the road. Maybe Rose and Chris have still got it, but they haven’t got quite as much of it as that. Well, that would explain why the Belgians weren’t worried about the lift being out. Though it doesn’t actually explain why they sold us the tickets in the first place. Damn. We’re going to have to go back to Liege-Guillermins and take a taxi. The Liege-Guillermins train comes in. Oh. It stops at the other platform. Over there across the tracks. To get to the other platform involves going down two LONG flights of steps and up two LONG flights of steps, just as much as going to look at the palace of the Prince-Bishops. Rose goes down to the ticket office. Can we just hop on the next train and go around the loop back to Guillermins? No, there’s no loop. The trains go to the end of the line and then stop. Can we travel to another station that is wheelchair accessible and get off there? No, haha, there are no other accessible stations on this line. A long line of people want to buy tickets, so Rose breaks off and comes back to contemplate the prospect of a long life spent entirely on Platform One at Liege-Palais. Or, Rose points out, we could take the direct route to the other platform. Look at the timetable; no train for ten minutes. Chris jumps down to the tracks. Rose passes me down. Chris picks his way over the flints and lies me down on the far platform. Rose crosses over and steadies me. Chris goes back for the wheelchair. See, no problem. That’s accessibility for you! I mean, the only risk would be a fast through train that wasn’t on the timetables, and what are the odds on that? The train comes in and Rose and Chris lift the chair on. Luckily the return train to Liege-Guillermins stops at a different platform from the one where the lift was out of order. Where, however, the lift is also out of order. A pattern seems to be emerging. We walk down to the end of the platform, where there’s a path across. Unfortunately, it’s too late to go to the Palais, so it’ll have to wait till next trip. 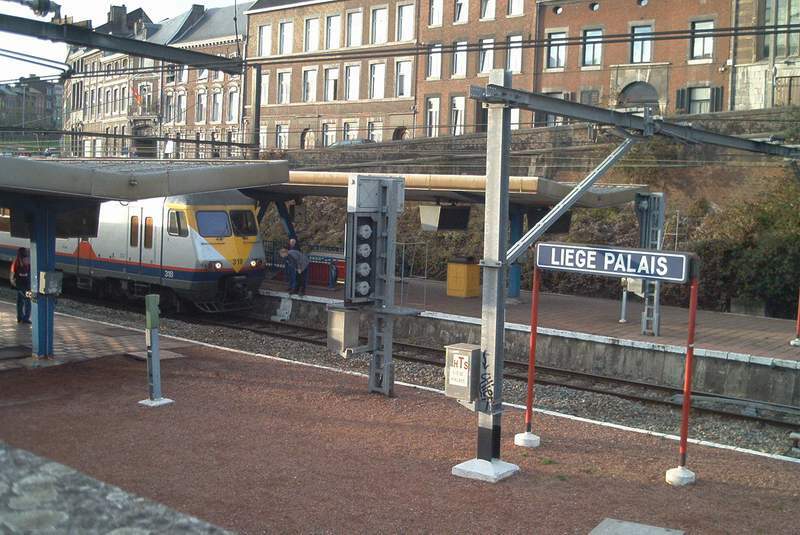 When we go to complain we are told all would have been fine if we’d come to the station 15 minutes before the train to Liege Palais. Presumably they’d have texted Superman and had him waiting to fly me out. In the afternoon Rose goes off to do some more client work, and in the evening we go round to have dinner with the client and his family with Belgian beer and Belgian frites. I’m sure it would have been delicious if I was able to eat. And the next day we head off to Cologne, or Koln, as the inhabitants keep trying to call it.